After spending over a decade working alongside butchers, Michelin star chefs and casual dining operators who specialise in offering their customers dry aged beef, Williams has acquired market leading expertise in the process. Alongside its established range of walk in meat ageing models, Williams has now launched a new Meat Ageing Refrigerator. The process of ageing meat is one that has been around for centuries, but its emergence into more mainstream dining culture is a result of the foodservice industry becoming more aware of how the process improves the flavour of meat, tenderises it and enhances the whole dining experience. Caterers soon realised that alongside the importance of the quality of meat on the plate is the ‘food theatre’ that it can create, something that Williams has taken into account when developing the Meat Ageing Refrigerator. Key to the process of ageing meat are the conditions in which the meat is stored, with not just temperature but also humidity vital to the final flavour. Williams’ Meat Ageing Refrigerator operates at the ideal temperature range of +1 to +6°C and provides humidity between 60-90%, ensuring that meat ages perfectly. The inclusion of Himalayan salt blocks assists with moisture management and improves the flavour of the meat. Stylish design is combined with a robust, all stainless steel construction, including its full length, heavy duty handle. 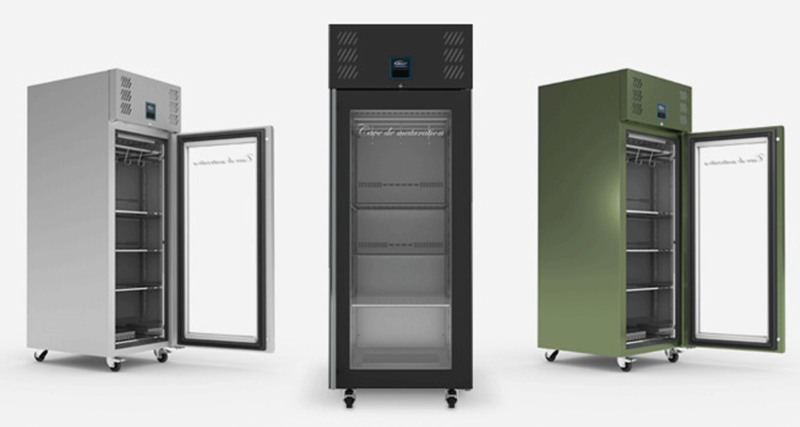 The meat ageing refrigerator is able to operate in environments of up to 43°C and the interior is brightly lit with energy saving LEDs, making it perfect for front of house display. Meanwhile, a personalised touch can be added with Williams Chameleon wrap service, seamlessly slotting the refrigerator into any décor or setting. The perfect ageing conditions are maintained by the presence of a self-closing glass door, coupled with heavy duty, PVC magnetic balloon gaskets that provide a 100% tight seal. A barrel lock also provides security and reassurance in a front of house setting. The Williams CoolSmart controller ensures energy efficiency and a clear digital display shows the status of the unit at all times. Capacity and versatility are well managed, with room for four 2/1 GN perforated stainless steel shelves with anti-tilt tray slides, each able to hold a maximum of 20kg per shelf. Alternatively the unit can be supplied with meat hanging rails. Williams’ green credentials are underlined by the fact that the unit uses a natural hydrocarbon refrigerant. The Meat Ageing Refrigerator also has eco-friendly high density 80mm polyurethane insulation, which provides optimal thermal retention and has low GWP and zero ODP. The new model measures 727mm wide, 824mm deep and has a height of 1960mm. Its capacity is 620 litres.